Its no secret that I love to entertain, that I love hosting parties. 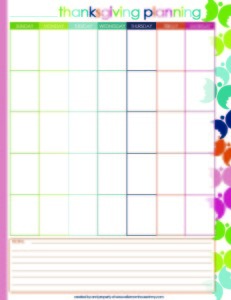 Perhaps it is because it puts my keen organization skills and detailed eye to good use and somewhat honors the control freak in me. Regardless I love entertaining! 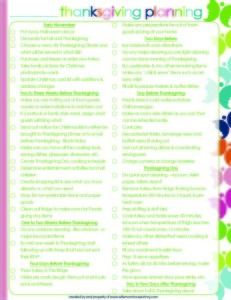 Add to it the joy of the holidays and fall (my favorite albeit too short season), I’m in party planning heaven! This year’s Thanksgiving is going to be a little different for us. Typically our family trades off the major holidays – Easter, Thanksgiving, Christmas – so that no one family bares the brunt of it every holiday and every year. It works out well for us usually as we divide and conquer the food and shift the house and major cooking each holiday. But this year our family has had some unexpected challenges – mainly my Uncle’s so not expected emergency quadruple bypass and the two month rollercoaster that followed. Typically, Thanksgiving belongs to my cousin, his daughter, but one of the complications that comes from the surgery and his 2 month recovery is long car drives are out. So that leaves an interesting conundrum for our family…individual family Thanksgiving or Thanksgiving here for all. I’m personally rooting for Thanksgiving here for all but it has been since I was a child in North Carolina, with no physically close family, that I had an intimate Thanksgiving family dinner. But either way Thanksgiving is going to be here…Party! As I found out last year in planning our first parties in our new home, hosting is truly hosting regardless of where its held. This is a good thing because I have plenty of experience hosting. Pulling a well organized get together does happen in a split minute, and depending on the size of the gathering, not even in 24 hours. For an event such as a holiday party, two weeks is a good time frame to give yourself from plan, prep to party. You can take longer but two weeks give you some breathing room in case something comes up. 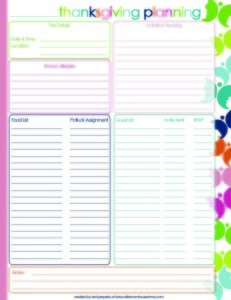 I also always use a checklist and a plan but I put it all in one in my party planner sheets. 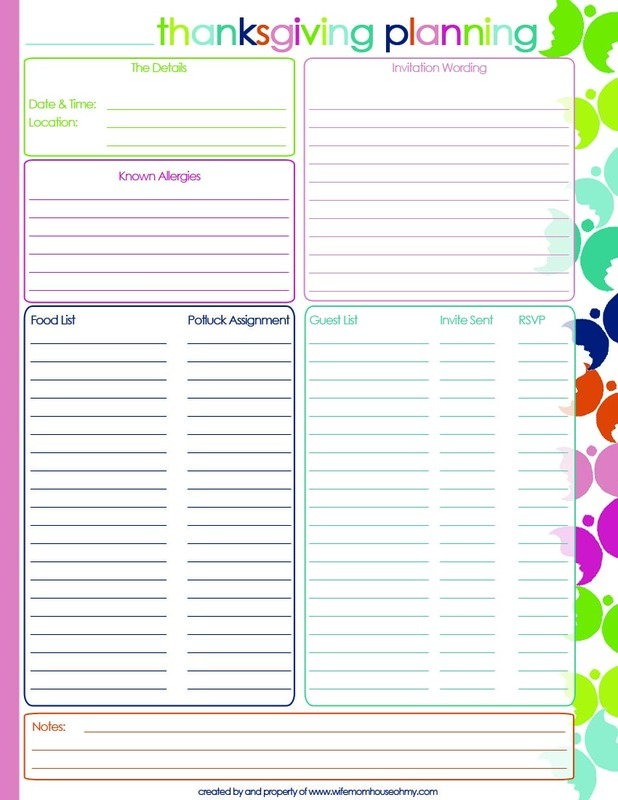 It keeps all the information in one location and makes staying organized much easier. 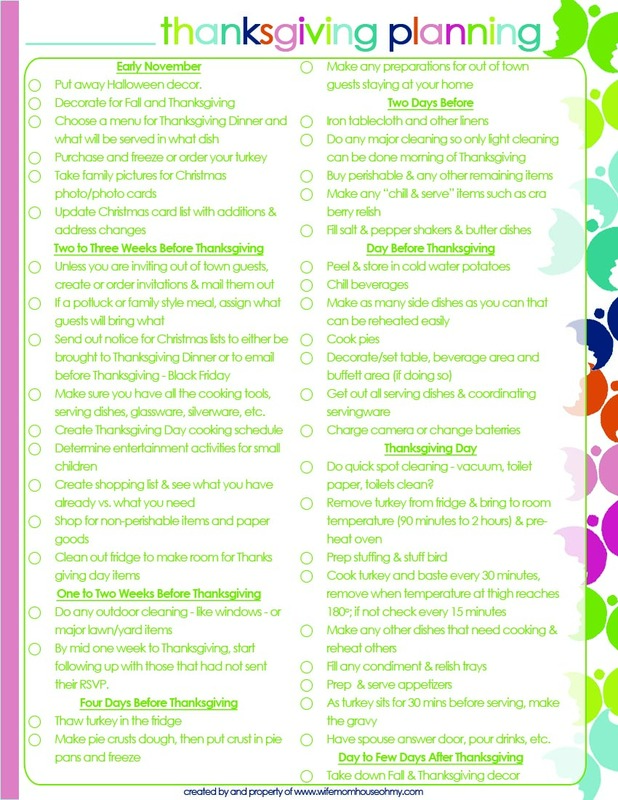 This will definitely be more than helpful this year as I probably won’t know until the week of Thanksgiving which way our family will go. So here’s my general plan. I’m going to plan for a dinner where I/my immediate family are providing all the food, drinks, location, etc. I will be doing that if it is just our immediate family but if I find out that the extended family will be coming, then I can divide up the menu amongst us. If you ever find yourself in this type of situation or similar, I always try to plan for the “worse case or most work” scenario, then create alternates. It helps eliminate most “surprise” challenges. 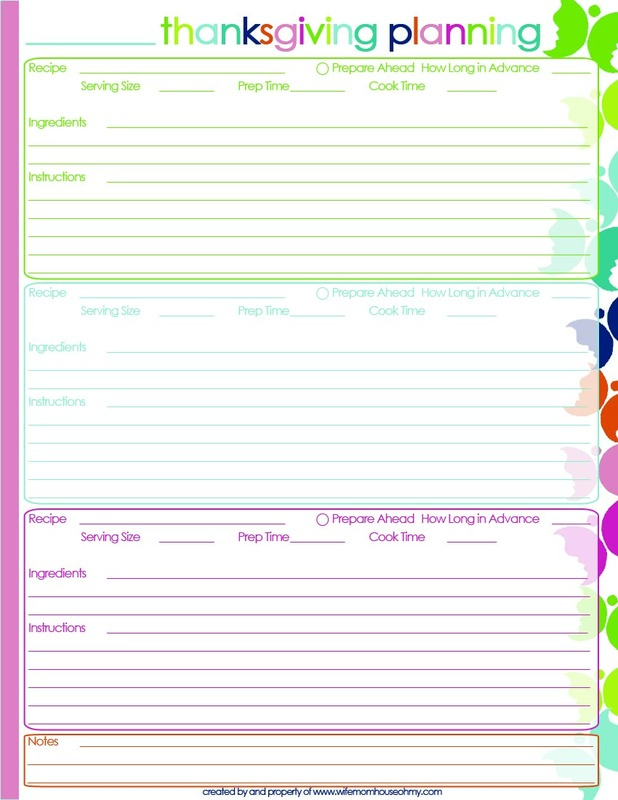 One of things that I find important in planning is having it all in one place – and not just what you are planning but all the extras such as cooking times, calculations for serving amounts, recipes, etc. 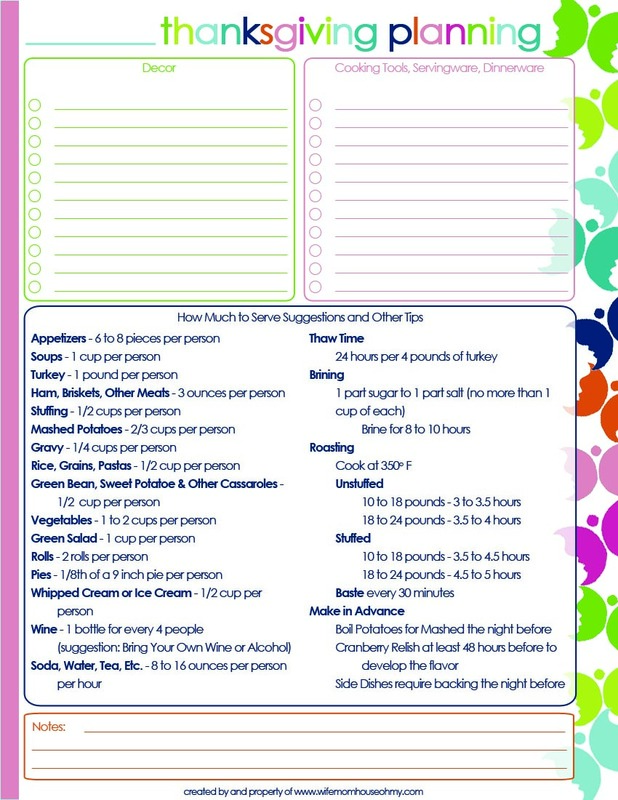 Thanksgiving to me is generally a pretty set kind of holiday for our family so I modified my party planner sheets to be strictly related to Thanksgiving. 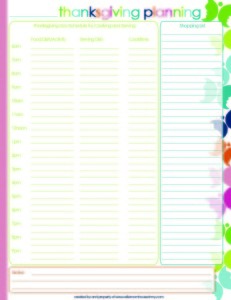 I am especially looking forward to using the calendar and checklist to set dates to when I want to accomplish what. 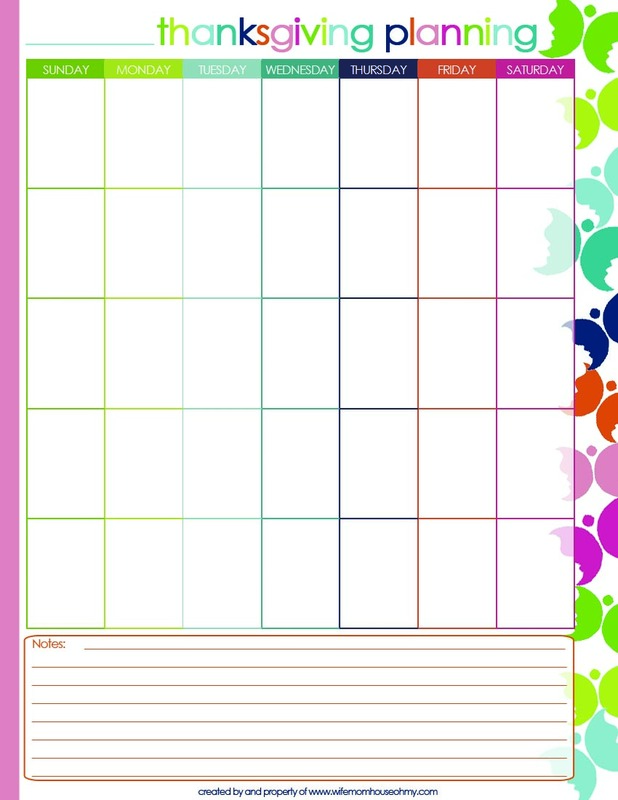 This should keep me on task and help me from feeling overwhelmed. 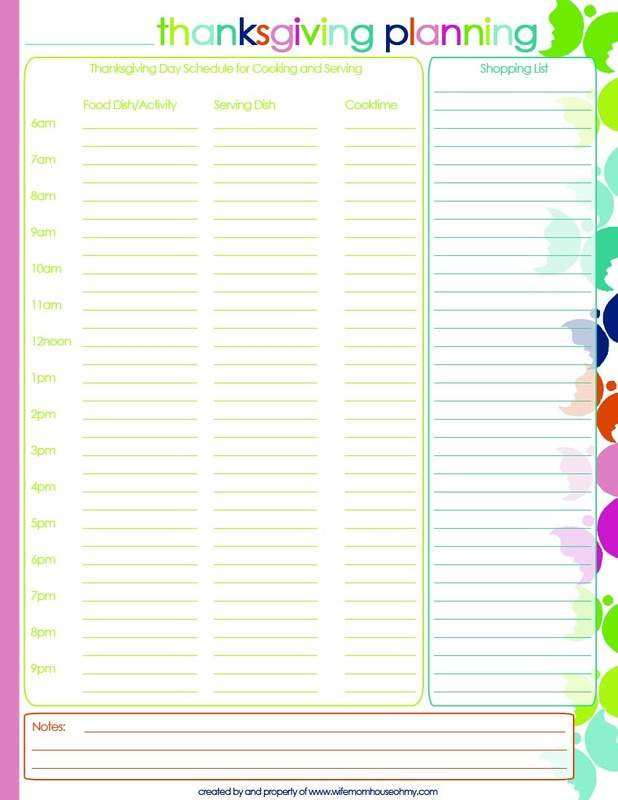 I even included a Thanksgiving Day Schedule that I can customize based on our families needs such as who doesn’t get of work until when, who has to be at work that night, who doesn’t drive at night, etc. By planning it out in advance, I feel confident I won’t be frazzled and anti-social while things cook or worried about what should go in when. 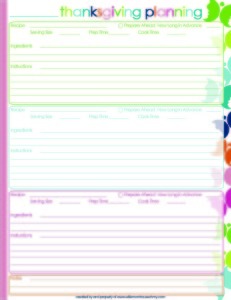 And the recipe section will keep every dish at my finger tips. I will never have to hunt for my grandmother’s cranberry relish recipe or my yummy Jack Daniels Sweet Potatoes Casserole. 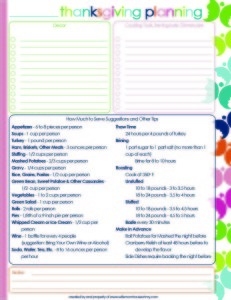 My plan sheets are below and you are welcome to them for personal use only. I hope they help you keep your sanity this holiday…I know they will help mine. There is more to come as I survive my first FULL Thanksgiving Party.